It's not often you find something that tastes so delicious. 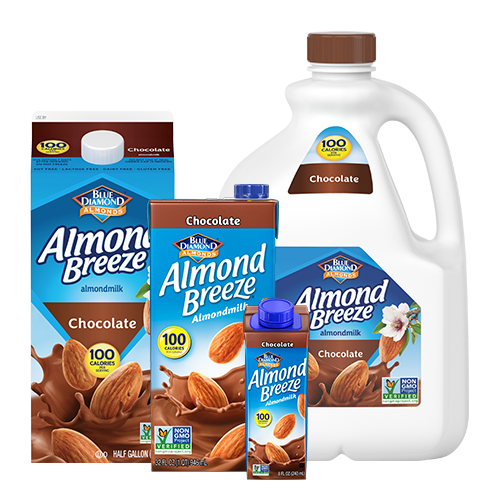 Almond Breeze® Chocolate is one of those rare treats. The creamy texture and chocolaty richness is perfect for satisfying your cravings for something sweet and chocolate. It's also calcium enriched, lactose free, and soy free. ALMONDMILK (FILTERED WATER, ALMONDS), CANE SUGAR, COCOA (DUTCH PROCESS), CALCIUM CARBONATE, SEA SALT, POTASSIUM CITRATE, NATURAL FLAVORS, SUNFLOWER LECITHIN, GELLAN GUM, VITAMIN A PALMITATE, VITAMIN D2, D-ALPHA-TOCOPHEROL (NATURAL VITAMIN E).